What do you do if you need recharging electric vehicles in the apartment building you live in. If the superintendent finds out and tells you that you are not allowed to use this electrical outlet, what do you do? This is a huge impediment to sales for electric vehicles that need to be recharged every night. It is just one of the many problems that the fledgling electric vehicle industry is facing. In our last post we talked about how to provide an electric recharging stations. Also how the infrastructure needs to be upgraded. 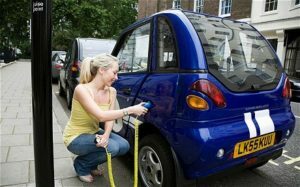 In another post we discuss the same issue in condo buildings were owners of the condo would not allow one car owner to recharge his vehicle. People do not want to be bothered by these kinds of issues. The supply of power is going to be the single issue that will prevent many customers from getting on the electric vehicle bandwagon. The car industry needs to solve this issue. They need to try to resolve much of the negative words in the press. These are real problems that need to be solved and unless they are solved, the electric vehicle is not going to sell well. Apartment buildings are even worse in some ways because owners do not want to incur any more cost that will impact their overall profit. Upgrading the electrical system to handle the increase power draw and adding outlets in the parking garage, not to mention the electrical usage are big negatives for the owners. They are unlikely to spend money until there is some perceived advantage for them such as competition or profit. The apartment building owner is motivated by profit and if we are to solve the recharging station issue for electric vehicles, the entire industry will need to figure this out. However we are focused on apartment buildings in this post, so we will stick to that subject. The owner will need to spend some money to install electrical outlets at a number of parking spots in his parking garage. He will need to make sure that the electrical system can handle the increased electrical load and may even need to upgrade some the circuits to handle this increase load. Load can be determined by the number of cars that would be charging at the same time. the cost of these upgrades must be amortized over some period so that he can recover his cost plus a profit. There is also the cost of electricity that is actually consumed. With these two numbers the apartment building manager now knows what the cost will be to provide electric charging stations for electric vehicles. He may or may not want to add an additional amount to this number so factor in his profit. Sounds easy doesn’t it, but there is one more problem and it is very difficult to solve. No apartment building owner is going to spend any money at this point for one or two vehicle owners that may want to charge their cars in his buildings. Right now he needs to recover his cost in a a reasonable time and he cannot charge all of the upgrade cost to one or two owners. We think that this situation will gradually resolve itself over time as demand increases and availability of stations becomes a competitive issue. Governments can also help as well by offering incentives to provide these stations. It may take 10 years to reach the tipping point, however we are very confident that we will get to a heavy concentration of electric vehicles that will drive solutions that are cost effective for drivers as well as apartment building owners and condo’s as well. It will become common place to offer recharging stations in apartment building parking garages. The auto industry has to get in on this and start doing some of the things needed to help the industry along. They need many locations to charge your vehicle were you pay for the power at reasonable rates.